Let's get serious. If you don't own a classic striped tee you need to buy one now, because they are a wardrobe staple for women of all styles and demographics! 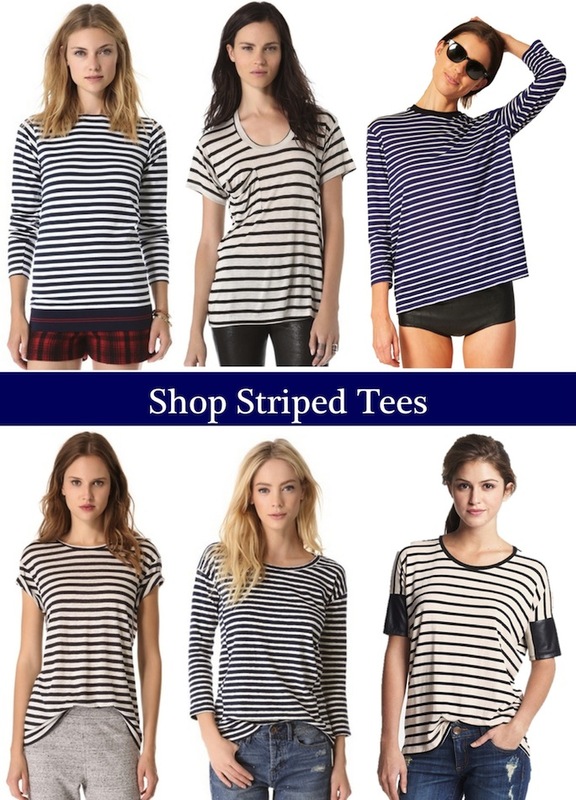 Classic Breton stripe tee's are so prevalent among ladies of style including actresses, fashion editors, bloggers and models, that it seems unfathomable we may not already own one, or two. Worn with cut off shorts and a biker jacket they look cool and edgy, but then when paired with a feminine skirt stripe tees take on a sophisticated undertone. To keep this wardrobe staple classic stick to neutral colors for the stripes: black, navy, blue, cream, white, beige and grey. I'm pretty much obsessed with everything about this picture from Tory Burch. From the slim stripe sweater (I know, we're not technically talking about 'sweaters' but...) paired with print pants to the orange mini bag to the model's wavy hair. It shows that as a print, a slim stripe can almost take the place of a neutral solid, making it a great thing to pair with other prints. There are a few popular go-to brands when it comes to finding a great stripe tee/knit: J.Crew, Vince and T by Alexander Wang. All three make classic shirts that wear well and look nice dressed up or with jeans and flats. If you are looking for a budget buy GAP is the way to go! The striped tee is a must have! love this! so simple yet chic! They go with everything! I love it. I adore this fashion item and in my wardrobe it's in the top-list! They really are a must have in many colors. I recently realized just how many striped tees I own so I am now cutting myself off for at least a few months. Navy stripe is always a fave. We are you newest followers! I have farrr too many of these, so I agree! Loving the striped tee for the fall season! I have a slight obsession with striped shirts. oh yes! I own a few of these! I'm pretty positive there is no such thing as TOO MANY striped tees. I seriously could wear one every day of the week!